How about a little bit of beading to jazz up a plain bauble or enhance one of your own beaded creations! This bauble hanger has a 3D bow made solely out of delica beads with a 6mm crystal bead in the center with a rub over style setting made out of delicas, appearing to look like a jewel in the centre of the bow. This little bow hanger is fast to bead, taking around 1-2 hours to complete and is also a great way to use up spare colours. The bow is made using Even Count Peyote and just a tiny bit of Round Peyote with just one length of thread, so no tying thread on and off for each individual part and no fiddly Odd Count Peyote turns to complete or time-consuming Brick Stitch! There are even bonus instructions to make the bow once created into a brooch or hair band! Once you have made one or two you will find these little beaded bows are so simple to make that you can make them from memory and not even need to refer to the pattern – making these bows a brilliant idea to make as gifts this Christmas. 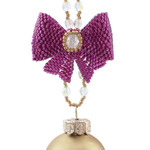 Who would not want to receive a bauble with a hanger so exquisite! Although no knowledge is assumed, it is recommended that the beader does have prior experience of beading. Techniques used are Round Peyote and Even Count Peyote. As usual with ThreadABead featured patterns we give full detailed photographic instructions and in this pattern there are 80 detailed steps. Please note the pattern may not work with any other size and type of beads. There are 2 colours in total and the finished beadwork (including loops) is approximately 3.5(w) x 9(h) cm A no tangle thread bobbin is very useful and 6lb crystal Fireline thread is recommended. 1x 6mm crystal AB is required along with 15 x 4mm crystal AB beads. If you would like to make a hairband, 1 x elastic hairband is also required. If you would like to make a brooch, 1 x 2cm 2-hole brooch part is also required. The bead pattern supplied is 29 pages and includes full colour photo instructions.